I have used APC (American Power Conversion) power equipment for a long time. I have had both good and bad experiences with their products (a cherished memory is calling their technical support and asking about the "smell of burning plastic" emanating from one of their units). 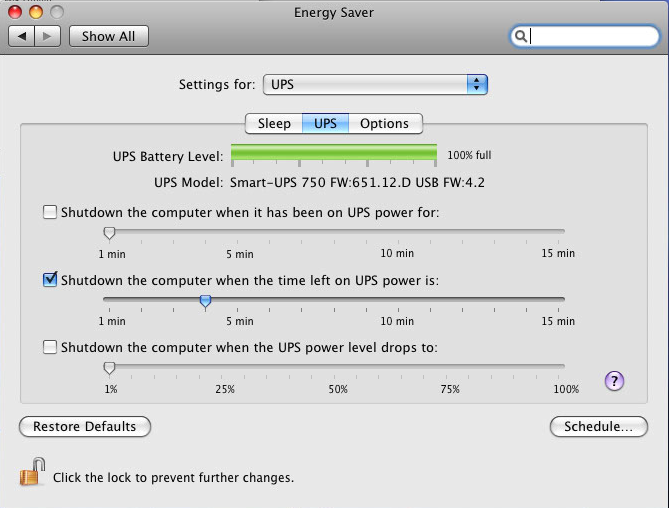 I've recently upgraded an Intel Mac Pro to Snow Leopard Server (OS X Server 10.6.2) and noticed that the controls in Energy Saver for the UPS are different. Not in a good way. After reading a thread on Apple's support site about APC UPS Charge Percentage Not Updating I changed the setting on the server to that shown in the second screenshot above; namely, since the computer can't seem to read the charge percentage, it's better to let the computer monitor how long it's been on the battery. 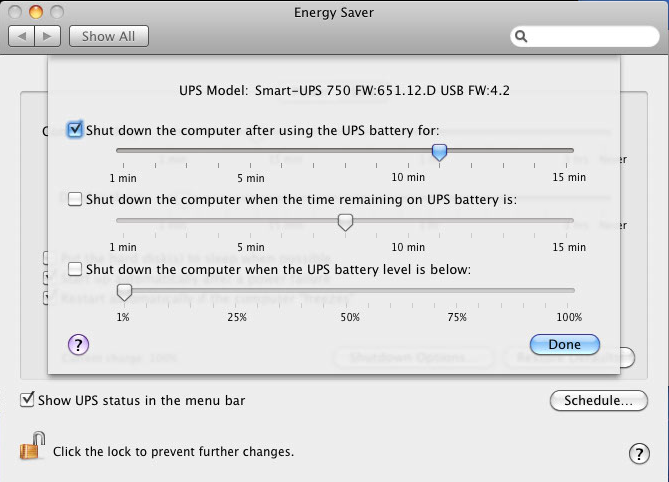 Another annoyance is that I keep getting the dialog Your computer is now running on UPS backup battery power. The UPS is supposed to self-test every 14 days but I'm seeing the dialog more often then this. It makes me uneasy, and I don't like being uneasy about servers. Permalink Submitted by Joseph Linaschke (not verified) on Wed, 2011-02-16 10:37. Basically I'm wondering if you've found a solution to this yet. I am having the same problem with my Cyberpower CP1500AVRLCD. Permalink Submitted by John on Wed, 2011-02-16 10:45. Even on the current version (OS X 10.6.6) this remains broken. My solution was to use apcupsd instead.